Before administration, add 1ml of bacteriostatic water to the rhGH vial of lyophilized powder, and make the solvent run slowly down the side of the vial. Swirl the vial with a gentle rotary motion until contents are dissolved completely. Do not shake vigorously. The dose of administration should be individual for each patient. For growth-promotion purpose in children, the recommended dose is 0.1-0.15 IU/kg/day, once per day, subcutaneous injection. The period of treatment is from 3 months to 3 years. Or follow your physicians prescription. For severe burn patients, a daily dose of 0.2-0.4I U/kg subcutaneous injection is recommended. The period of treatment is about 2 weeks. The dose might require adjustment individually for human GH replacement therapy, please follow your physicians instructions. 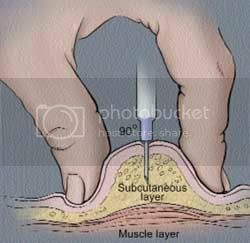 A subcutaneous peptide injection is given in the layer between the skin and muscle as seen in the picture below. Drug interactions may lead to side effects or decrease or increase the medicine potency. Check with your doctor that the other drugs you’re taking do not interfere with this drug’s action. Treatments of other conditions should be discussed before using Rex-Tropin. It is especially important to diabetics to check with their doctor because Rex-Tropin may change insulin levels. Rex-Tropin does not have side effects in most people. Most side effects will stop with continued usage or by lowering the dose. Common side effects are pain in joints, this is due to water which may be pushing nerves. If pain doesn’t stop consider lowering the dosage, talk with your doctor. Do not use the drug if you are allergic to any of it’s components. Please tell your doctor if you have any other symptoms at once. Keep a record of doses. If you are diabetic or using insulin or any other diabetic, sugar lowering medicine you should monitor your blood glucose closely because growth hormone may change your body response to insulin. Keep at 2-8C. Don’t freeze. Rex-Tropin is very stable and can stay for a month in normal room temperature. But it is still advised to refrigerate whenever possible and always keep away from direct light. After dilution it must be refrigerated. In case of sterile water it must be used within 72 hours. If you dilute with bacteriostatic water you can use even after 10 days or more. Information presented may be inaccurate, was not prepared by doctors and must not serve as a basis for any medical issue. By using this site, you indicate your acceptance to all terms, conditions and disclaimers as specified on this site. You must consult and get your licensed doctor’s approval before using Rex-Tropin HGH or any kind of item purchased from this website. All trademarks and copyrights belong to their respective owners and are acknowledged. Rex-Tropin.com is an independent site and is not affiliated in any way with any pharmaceutical companies.